I’m keeping this post simple. Studyladder. I think it’s pretty extraordinary, and most of what I can find is free – and there’s a lot of it! I’m sharing this link now because there are a lot of free holiday, Christmas, and end-of-year (2014, not the school year…sorry!) activities and printable worksheets here that are really quite good (and did I say…free?) . Click & enjoy the plethora of freebees – no explanation required. Once you get to the site, though, I encourage you to check out a relatively new feature called “StudyPods”. These are curricular resources in Math, Literacy, Science, Financial Literacy, Health & Safety, Art, Music, and Language. Again – there are a lot! Sign your class up for free, generate an included parent letter, assign items, and let your kids complete StudyPod assignments at school and at home. 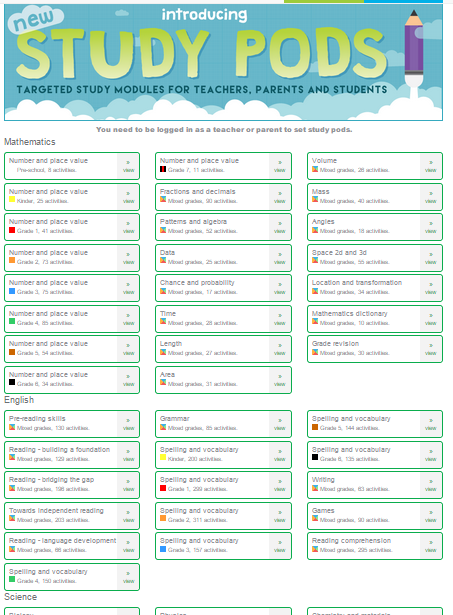 Below is a partial screenshot of the list of StudyPods on Studyladder. Studyladder is one of those sites that you’re going to want to dedicate a little time for exploring, but it’s not difficult. I think that each teacher will approach this site differently based on his or her grade level, subjects taught, and particular units of study. Because it’s free, openly accessible, teachers can track students, and there is a substantial amount of content, I absolutely think Studyladder is worthwhile! Note: Right now, Studyladder is offering a free upgrade. This confused me, as it seems most of the site’s resources are free. When I clicked on “Plans and Pricing”, it turns out that there are paid premium memberships, but I think those are primarily for parents. Stick with the free stuff….there’s plenty! As always….I’d love to hear what you think!